The Rt. Rev. William E. Smalley is our priest-in-charge. He is the retired bishop of the Episcopal Diocese of Kansas. Bishop Smalley earned his Master of Divinity from the Episcopal Theological School, Cambridge, Mass. He also holds an M.A. in Education from Temple University, Philadelphia, Penn., and a D.Min. from Wesley Theological School, Washington, D.C. 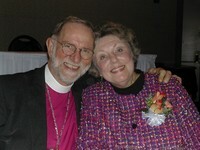 He was ordained a transitional deacon and then priest in the Episcopal Church by the Rt. Rev. Frederick J. Warnecke, Bishop of Bethlehem. He served in various ministries in Pennsylvania and Maryland before being elected bishop of Kansas in 1989. During his tenure as bishop, Bishop Smalley was president of Province VII of the Episcopal Church, president of The Presiding Bishop’s Council of Advice for both Presiding Bishops Edmund Browning and Frank Griswold. “While the ministry with many congregations as a bishop was a good and important ministry, I rejoice at being involved in the day-to-day life of a congregation,” Bishop Smalley said. Christy Holbrook joined Trinity Church as organist/choir director in December of 2015. Christy is a graduate of AU’s School of Music and has served as an organist/choir director with churches in Anderson, Daleville and Indianapolis.